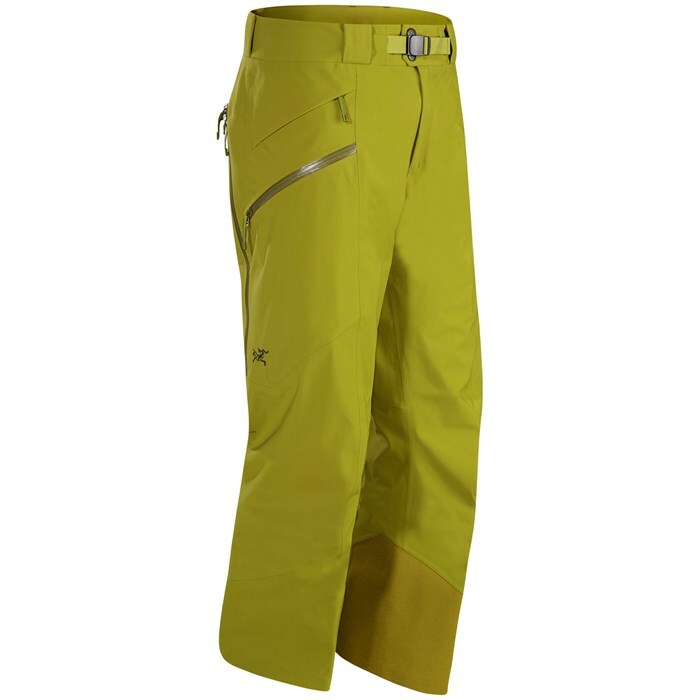 The Arc'teryx Sabre Pants are an amazingly waterproof, hard-charging option for stormy days at the ski resort. With durable 3L fabric, a GORE-TEX® membrane and a soft, lightweight flannel lining, this pant is certain to keep you dry and warm season after season. The Sabre also has several handy thigh pockets with WaterTight™ zippers, and a helmet compatible hood. For increased protection from the elements, use Arc'teryx Slide 'n Loc™ attachments to clip this jacket to the Sabre Jacket. 80 Denier Nylon Plain Weave  Developed in conjunction with GORE®, a project 5 years in the making results in an exceptionally durable plain weave nylon face with high resistance to abrasion. Dense construction minimizes the exposure of yarns to abrasive contact, reducing damage to filaments and maintaining surface integrity. Finished with a durable water repellent (DWR) coating. Lo Loft Softshell Construction  Warm, moisture-wicking polyester flannel backer. Relaxed Fit  Created with extra room for enhanced movement and multiple layers. 100D Cordura® PowderCuffs™  An integrated elasticized cuff that fits over boots and prevents snow from entering from the bottom of the pant.